My former Salon colleague Farhad Manjoo is out the gate early with an elaborate and delightful April Fool’s stunt called “I Google For You.” Check it out. I can’t figure out if it’s truly the latter-day, John Henry, man vs. machine thing it purports to be, or whether there’s in fact some Eliza-style script behind the scenes cranking out the slightly customized search results. Since upon inputting one query I learned I was 84th in the queue, yet I received a link to my answer in an emailed reply within a minute or so, something tells me there’s more machine than man at work here. Either that, or Farhad’s in for a long night! NY Post: Go online, end your career? Not everyone who was spared in the Business 2.0 meltdown is going to Fortune. Erick Schonfeld, who was an editor-at-large based in New York, has decided to end his 14-year career and jump to Michael Arrington’s influential blog, TechCrunch. There’s a Walgreens on the corner I pass every morning between BART and the office. (There’s a Walgreens on most corners that haven’t already been occupied by a Starbucks.) And recently, every morning I have seen this sign, and every morning I experience a little twinge of awe. Are they like the Indian restaurants clustered on 6th street in New York’s East Village, long rumored to be connected via underground tunnel to one central kitchen? Or is this connection more metaphysical — do the stores experience that oceanic feeling of connectedness that tells them, yes, they belong here, they are at home in the world? 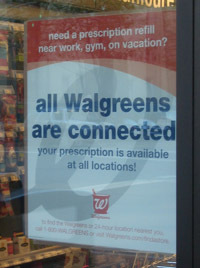 I knew Walgreens was a chain. I didn’t know it was a great chain of being. Visual design guru Edward Tufte’s new book, Visual Evidence, is out. I haven’t read it yet, but if it is anything like its three predecessors it will not only be eye-opening but will embody the principles it espouses. I wrote at length about Tufte almost a decade ago in Salon, in March ’97. “What happens when you take everything in your house and make one giant chain of dominos?” Some people in Japan find out. It’s on YouTube. I saw it because Doc Searls linked to it back when only 250,000 people had viewed it, and now over 500,000 have, and we should really be shooting for >1,000,000, so I’m doing my part. This incredibly short little [tag]science fiction[/tag] tale will take you only a couple minutes to read. BoingBoing pointed it out a while back and I just stumbled upon it again. It’s a thing of brilliance. Also funny. The title is: “They’re Made Out of Meat.” The author is Terry Bisson. Read it. There is also a well-made little film on YouTube but I prefer the text. Tonight President Bush will announce his plans to deploy National Guard troops on the Mexican border to rein in illegal immigration. In times of political difficulty and sinking polls, Bush has always found troop deployments a tonic. For seniors who have been tardy about signing up for a Medicare drug plan, what could be more effective than a GI at the door? It may be that, as Bush has put it, “Deadlines help people understand there’s finality” — but gun barrels are even more persuasive. Schoolkids across the U.S. know that their future depends on how they perform on a growing array of tests that are the Bush-era education system’s hallmark. But if you really want kids to understand a test’s gravity, there’s nothing like the impassive stare of a sergeant at the front of the room. Under the Bush administration the I.R.S.’s army of auditors has focused its efforts on making sure that low-income filers claiming the earned income tax credit aren’t cheating. Surely this enforcement effort would prove even more effective with a little military muscle behind it. Suspect taxpayers could have their returns reviewed in the belly of an Abrams tank. If that’s not sufficient, Vice President Cheney could approve a Geneva Conventions waiver. The Bush team has faced what it views as outrageous delays in obtaining Senate approval for its most conservative judicial nominees. Well, why wait for senators to achieve consensus or compromise? Why not just deploy a Marine battalion to Capitol Hill? Special prosecutor Patrick Fitzgerald may or may not be on the verge of indicting Karl Rove. But isn’t this endless Plamegate investigation distracting the government from its important national security mission? To end this threat, all it would take is a 3 a.m. visit from a Special Forces team. Really, once you get going down the road of martial law, the possibilities are endless. Mike Arrington is the lawyer-turned-blogger-and-entrepreneur whose TechCrunch has become the Web site of choice for people attempting to keep up with the cornucopia of startup companies pouring onto the Internet under the Web 2.0 banner. The amazing thing to me about Arrington is this: He somehow keeps the names of these companies straight. Skobee? Renkoo? Is Mr. Mxyzptlk in the house? I remember when Yahoo launched (yes, I’m becoming a Net codger), thinking, “Boy, that’s an odd name to try to build a company around.” What I saw over the ensuing years was that it doesn’t much matter what you name a company as long as the brand is strong enough — people will just project the qualities they associate with you onto the name. For that to work, however, you need users — a lot of users — so that you can fill the random syllables with meaning. That’s much harder in today’s overpopulated Web 2.0 scrum, full of hard-to-distinguish competitors featuring similar two-syllable names, curvy cornered designs, and rounded fonts. I realize that many of these names are chosen out of desperation, since all domain names that actually communicate meaning have been squatted upon by speculators. And if your business is really all about adding a feature or two to the Great Big Web Application In the Sky (or, I guess one should say, Cloud), then your end-game plan is to be acquired by some large company that already has a meaningful brand and intends to toss yours in the garbage anyway — so why waste too much thought on your name? Still, Web 2.0 sometimes seems in imminent danger of collapsing in a heap of cutesiness, obscurity and alphabetical anarchy. I am trying to pull together my notes and thoughts on ETCon but keep getting distracted. I stared at this for a little while trying to figure out the site’s intent; after all, a set of presidential action-figure yoga poses shouldn’t necessarily be construed as mockery. Then again, the film clip that is the site’s only other content makes its politics pretty clear. Finally, I wonder if they chose not to show the president in “corpse pose” (savasana) for fear of provoking the attention of the Secret Service.